Who knew it has been 100 years since the first screening of a 3D film? 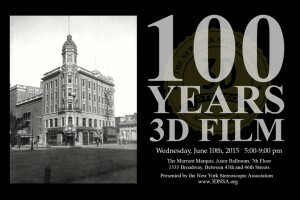 To mark the occasion, New York Stereoscopic Association hosted an event to celebrate the 100th Anniversary of 3D Film. One Night in Hell was screened as part of this exclusive event, which took place on June 10th 2015, exactly 100 years after the first ever 3D film was shown, and in the very same location too, in Times Square, New York, where the Astor Theatre used to stand.